Steve Elkington & Diane Knox discuss PGA & PLAYERS Championship moving dates in '19 and what kind of an effect it will have on the tournament. [MUSIC PLAYING] SINGER: (SINGING) It's Secret Golf. It's what I'm looking for. It's why I get up every morning, call my good time with friends, keeps me coming back for more. Secret Golf, we're headed down the road. We just load it up, big show, going looking for the hunting store. Rolling until the wheels the fall off, it's Secret Golf. Shh, it's a secret. KNOXY: This a Secret Golf with Elk and Knoxy, the podcast. I'm Knoxy, or Diane. I hope you're good. It's the week of the PGA Championship at Quail Hollow in Charlotte, North Carolina. Now, we have a podcast coming up for you a little bit later on this week. But we just wanted to do one for you right now on the back of the news today from the PGA. Now, this is a great thing about Secret Golf, is we bring you all the action from the tournaments, we talk about our players, we have our players on, and our past two podcasts, we have been joined by Jason Dufner and Brian Harmon. And in the next couple of days, you'll be hearing from recent winner on the web.com tour, Martin Piller, as he looks to work towards his PGA Tour card for next year. But we also can talk about the big news that happens in the world of golf. And today, there was big news coming from the PGA surrounding the PGA Championship and the Players Championship as well. Now, it's been in the news for a while. There's been rumors of it happening, I think, over the past couple of weeks. It wasn't really a rumor anymore. We were almost just waiting for the announcement. But today, it was announced that the PGA Championship is going to be played in the month of May, and the Players Championship will move from May to March to be played still, of course, at TPC Sawgrass in Ponte Vedra Beach, Florida. Now, of course, everyone has their own opinion on this, and maybe something to say. But today, when the PGA made their announcement, they gave their reasons being that they want to promote the best interests of the signature spectator championship. They want to do what's best for the players and the game, and growing at the game of golf too. The first person I talked to when the announcement was made was, of course, Elk. He's at home in Houston in Texas. So I gave him a phone. Now, At being a winner of the PGA Championship, and a two-time winner of the players, of course he was going to have something to say about this. And I want to start the conversation by talking about the players moving to march, because it was in March when Elk won it those two times. ELK: I think 12 years ago, 13 years ago when they changed it to May, they're using exactly the same idea, which is we'd like to have a major championship or something each month. They're using exactly the same excuse again. They're saying now we're going to put it back to March. So we have the March, then we have the Masters, et cetera, et cetera. They said back then nobody liked the Players Championship in May. It was a much better event in March. And I think moving back to March from that perspective is going to be excellent for the tour. KNOXY: So why do you think nobody liked it in May? What was the main reason why they wouldn't like it in May? ELK: It was a lot hotter in May. The grass, it was a whole different style of golf course in March. It was designed-- it was designed by Pete Dye. And when we played in March, there was a lot more wind. The turf was a lot different. It was more of a Bermuda-based turf, a lot windier, a lot more inconsistent weather patterns would come through, thus making the tournament much more difficult. As you can imagine, we all see the [INAUDIBLE] green, where these guys are getting wedges and nine irons across there. Imagine in March when you have a 30 mile an hour crosswind coming across there in-- with an [INAUDIBLE], these guys hitting six irons into there, you talk about dramatic. When I won the tournament in 1991, I hit a driver in a three-- driver in a three iron, famous three-iron shot out of a divot to win in 1991. And when I won in 1997, it was a driver and a four iron. So we're not going to see the driver and wedges. It's just a different time of year. Everybody knows when it's coming out of the winter the turf's a little lower. It's just a lot different. And the weather patterns that come through Florida that time of year are very, very windy. I mean, Jack Nicklaus won the Players Championship at record three times across the street at Sawgrass before they built the Players Club. He never did win at the Players Club across the street where we play now. But he said that that week in March was the most difficult week on any on the calendar for the whole year, was that week, weather-wise. Do you think-- how do you think it's going to impact the spectators, because while I was at the Players this year, and it was so hot. For four solid days, it was so hot. So do you think it's going to be better for the spectators having it in March, or is everyone really keen about that? ELK: I-- I was actually there with you, and it was like 100. So yeah, it was gross, which is, in fact-- I'm sitting in some 100-degree weather in Houston right now, and it is equally as gross. I think, you know, I've seen-- I've seen videos of the Players Championship in the past, where we wore sweaters, when I won in '91. I had a sweater on the whole day, the last day. I remember Davis Love playing in the rain jacket the whole day when he won in-- in March. So it's certainly going to be a lot different. I think more than anything is the wind, you know. The Players Championship is a great tough test before April rolls around when we all go to-- we used to go to Augusta and get ready for Augusta. Augusta, you know, back in the day was known for some unusual weather patterns that come through there. We used to always pack sweaters to go to Augusta, and we still do on-- on off years. But certainly a match a month before that, it's going to be pretty, pretty dramatic. Now, the PGA moving to May, someone asked the other day should they move it to May. They-- they heard they were going to move it to May. I loved it in August. And I'll tell you why I loved it, because when I won the PGA in August, I was the last major champion of the year, and I got the golden child for eight months because the next major was in the next year in-- in April. So you've got nine or eight or nine months to be like the reigning last major champion. So I thought it was a great-- it's a great way to end the season, the PGA. And I also thought the PGA could sit at the end of the rotation, if you will, Diane, and look at what everyone else has done. For the-- the [INAUDIBLE] did this, and the US Open did that, and the British did this. It makes them react to it. And they could-- I felt like they-- they could get a very balanced tournament. A lot of people, a lot of players seem to think that we already know whether the press believes it or not-- they won't write about it, but the PGA is number one, you know, the number one ranked event for the whole year. They get the top 100 players in the field. And I-- I would say the second highest event would be the Players Championship. Those two, guarantee you get the top 100 players. KNOXY: Another thing that people have been talking about for the PGA Championship moving is [INAUDIBLE] for the Olympics. Now, obviously, the Olympics only around once every four years. Do you think that's got anything to do with it, or was that just a bit of an excuse? No, I don't think it-- it has anything to do with it. I mean, I don't even think-- I mean, the tour, the tour was for the Olympics. But the players really never got into it. I mean, a lot of our really good players, you know, invented fake-- they have fake news. Now they have fake sickness. You know, have that fake-- fake [INAUDIBLE] virus. So all of our LPGA girls, and, of course, Gabby Lopez, who's on Secret Golf, and Stacy Lewis, [INAUDIBLE], they all went, and they couldn't wait to get there. And-- and girls, I'm sure Diane, you would agree, if you were going to have a child in you're-- as you-- in your future, they probably have more concern about illnesses than anyone. And they were all fine with it. KNOXY: Yeah. And from talking to [INAUDIBLE] from talking to Gabby, they loved it. Love say that it was one of the best experiences, not only of their golfing careers, but of their life. ELK: Yeah. It was very-- it was very underplayed over here by our top players. You know, you see that a time or two, you know, where you know, players will take a big stand on something, going along with it, so to speak. So the guys that went, let's face it. They have really benefited. You know, Justin Rose, major champion, won the US Open in Marion, and they're almost always now leaving with a gold medal. And I think some of these guys are thinking, wow, maybe I should have-- maybe I should have went over there and done that. This guy's getting a lot of publicity for being a gold medalist. KNOXY: Well, even Rickie Fowler has got the Olympic rings tattooed on his forearm. ELK: If I was going to get a tattoo-- if I was going to get a tattoo, Diane, it would have to be something very meaningful. So I'm just going with this. Ricky got one? It must have meant a lot to him. KNOXY: Would you get the Wanamaker trophy tattooed on your body? ELK: No, because I've got it here in the house. I don't know what-- someone asked me [INAUDIBLE] or something, or [INAUDIBLE] about what would you get tattooed on you, you know? I'll ask you, what would you get tattooed on you? If my mother passed away, or one of my children, I might think about it. But I would be just too scared. I don't know. What-- what would you get tattooed, Diane? That's the question. KNOXY: The problem is, I'd go and buy a dress. And then a week later, I'd change my mind, and I don't even like it. So I think that whatever you've got-- I understand why people get, like, their kids' names. I don't have any children yet. So maybe one day when I have babies, I would want to get their name or their date of birth tattooed on my body. But apart from that, I really can't think of anything. ELK: Yeah. I'm sort of-- I'm down that track myself. And you know, you see some of the-- some of the kids get, you know, Chinese letters. But I mean, I don't even speak Chinese. So I can't read it. And probably neither can they. But anyway, the PGA-- so anyway, I've put my 10 cents worth in about what I thought was good about the PGA in August. One thing some of the people brought up today-- oh, it's going to be cold in New York. There's always those doomer people, that they always try to find something wrong with everything. But none of our tour players ever complain much about playing in the cold weather. I mean, we're so overheated out there that, you know, I think the golf courses will be ready to go in New York. You know, it could be, but hey, it's going to be great. KNOXY: So of the players, you think the-- the majority of the players are going to prefer the fact that the weather is going to be a little bit cooler for the PGA from now on? ELK: I don't think the players care. I mean, it's-- there's so much bureaucracy now. There's so much money they're playing for. Some of these are tournaments in $9 million, $8 million, $9 million, 12 places playing $150,000 for 12th place. I don't-- I really don't think they care. I mean, I think there's less input from the players now than ever. They just want to show up. I think I read a-- I think I read a-- Jay Monahan said today we have 46 events on the tour now. I didn't-- I can't even imagine that. I think Adam Scott this week said that, hey, I think the product's a little overexposed. I think we should shut it down, you know, 30 weeks, and maybe have a nice break like everyone else does. And I think that would be met by some of our players because they don't get a lot of opportunities to play. So you know, a full schedule on the PGA Tour, I think tour players average 23 weeks, 24. Now, of course, in my day, the greatest players of all, they only played 15. Jack Nicklaus never played more than 15. Greg Norman, he would 10, 15. Tiger Woods maybe played 18 events. So when you think about the guys not getting playing opportunities, you're talking about the ones that are not getting in every week. The guys-- all the top players get to play whenever they want to. Where do I sit on that? I think we're a little overexposed. I mean, some of these guys, they don't know when to play, and they don't know when to stop, right now. I talked to some of our players, like Pat Perez. You know, what happened to the West Coast? What happened to having Christmas off, and having a couple of months break, and put your clubs away? I remember Jack Nicklaus used to go back to Ohio, and never pick up a club until March. I mean, it's certainly changed. I don't know if it's better. KNOXY: But, of course, PGA Championship is this week. It's at [INAUDIBLE]. So we-- we have-- we don't even need to think about it moving, because right now, it's happening in our immediate future, and we're looking forward to a really good tournament. KNOXY: Great image of him. ELK: --nice to catch up with you, Diane. We'll-- we'll be following closely from here with the-- with the Wanamaker close to the TV. KNOXY: I can just picture him now. He's going to be sat at home, feet up, watching the action unfold on the TV from the PGA Championship, maybe having a little drink, aye, have the Wannamaker trophy sitting beside him. But there was a great story. This is one of my favorite Elk stories. And believe me, there are many regarding his 1995 win of the PGA Championship. But he somehow figured out that the Wannamaker holds 504 ounces of beer, or 42 cans. Basically, the story goes that Elk was at Champions Club in Houston. 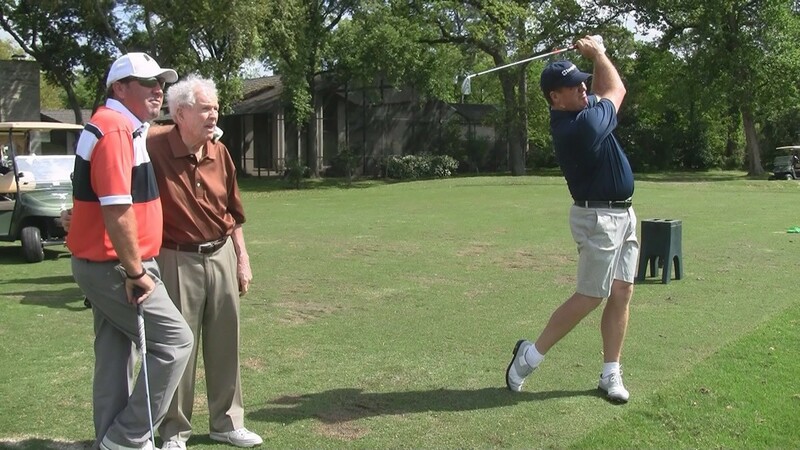 And he was with him his mentor Jackie Burke, who has won the PGA Championship, also Dave Marr, and Jay Herbert, plus three-time Masters champion Jimmy Demaret. So they were all together. And they were talking about their wins of the PGA Championship. And they decided to pour some alcohol in. And it took 42 beers. But then, of course, how can you lift it to take a drink? You would have to get a red solo cup, dip it in as a ladle, and fill it up that way. Good luck to all of our Secret Golf players, who are taking part in the PGA Championship this week. Also have to say, well done to Martin Piller from the Web.com Tour. Martin's one of our players too. And he won at the weekend, his sixth at Web..com title, 24th on the money list, and, of course, looking to finish in the top 25 at the end of the season to get his PGA Tour card. Elk is going to be chatting to him, and we will have another podcast featuring Martin Piller very soon. Thanks for listening.